JudoCoach.com Blog by Lance Wicks - On Skiing and Judo. As my family plans for a skiing holiday I decided to watch some skiing and... as I do... relate it back to my passion, Judo. This blog post is my impressions on both Judo and Skiing in terms pedagogy, experience and short versus long term effects of how yo learn to Ski or do Judo. Before I start, lets be clear, I don't ski, never have, never will. So yes I am biased and also it can be argued (mainly by my wife) that I have no right to talk about skiing unless I try it. She has a point and I'll try and keep that in mind whilst I write this. So here we go, you are in a ski resort/Judo club for the first time. Ulp... whats going on, what do I do, where do I go. In Skiing this is handled pretty well, you are probably there on a package via a tour operator and a rep will point you at the hotel, at the Ski hire store, at the ski lesson meeting place, etc. In Judo, well you found the Dojo right? Hopefully someone greeted you when you arrived. Maybe someone told you what to do, what to wear, what to expect? 1-0 to Skiing. Skiing seems to know how to make sure you get to the right place and have the right kit. This is helped by a viable economy around skiing. Ski stores sell you the kit and tell you what you need. Ski hire makes sure you have the right size boots, skis etc. So, you are on the side of a mountain wearing all your new gear and ready to get started. You can see the experienced skiers flying down the mountain, looks good, you can't wait to do that! You meet up with your ski instructor and are broken up into groups, based on experience/ability. As a total newbie, you start off being shown how to put your boots on, then how to slide on one ski, then on one ski (other foot), then the all important "Snow plow" position. Then how to walk sideways up the hill. So you side step up the (very flat) hill and then slide down in the snow plow. Then you sidestep up again, then snow plow again. And thats about it for the day. You probably have no new gear on, just some tracksuit trousers. Maybe you have a borrowed Judo suit (possibly cleaned occasionally). The class starts with a kneeling bow, then some running around to get warmed up. Then what? More than likely you are taken to the side and shown some basic moves. Probably your breakfalls, starting lieing on the ground hitting the ground with your hands. Maybe a basic throw, probably O Soto Toshi in the UK at least. Maybe you get to do some wrestling on the ground, maybe you get to do some wrestling standing up. Often you don't. Both sports IMHO, can give students a really bad first taste. Skiing day one looks duller than watching paint dry. Whilst Judo day one can be both dull and scary. Judo clubs on the whole I think give a better first experience, in that I think most new comers get to participate in randori. If only in a very light form. They get a taste of the sport. We teach them dull basics often (breakfalls) and sometimes throws that are a handicap perhaps. My personal view is that O Soto (in any form) is a bad first throw for new Judoka as it is hared to get right and easy to get countered from. O Goshi, Taio, Seoi are much easier (two feet on the floor), and harder to counter. So the new player is not learning a throw that does not get them thrown against most people they fight. Skiing on the other hand gives a really boring first experience (remembering here that I have never skiied ok). Side step for 2 minutes, slide slowly down the hill for 20 seconds, repeat. SNORE! Now, of course the deeper immersion in Judo is scary and more dangerous. Skiing is being more cautious. That said, I have seen classes where new Judo students learn only Ukemi and practice a throw without any randori. Which to me is equally dull and equally safety focussed. In skiing, you have most likely committed to a week of lessons, not to mention all the money you have spent on clothing, equipment hire, hotels etc. It is also a holiday activity (for most). So you are going to attend those classes for the whole week, no matter what the first experience. Judo on the otherhand is an evening activity, you have probably not spent any money on equipment or even on the lessons (first lesson free is common and session by session mat fees too are common). So if that first class sux, you won't be back. You have no investment in the activity, so it is easier to let it go. So Skiing does not need to worry so much about the first lesson experience. They know you'll be back day 2, day 3, etc. So as long as you get skiing near the end and enjoy it, they are fine. So perhaps the snow plow obsession (safety) is fine, they are going to keep you for a week, so they can let you be bored. Judo on the other hand has you for maybe and hour and a half. If you are bored in that lesson you are out of there. You are not (and I generalise) committed to any more than that one session. So in Judo we need to make sure you enjoy that first lesson. I think many clubs manage to make lesson one fun and enjoyable, some don't. Which in part explains perhaps why Judo is a kids activity. Parents choose Judo and apply the kids go because Mum/Dad wants them to try Judo. Maybe it's just a term, as it fits in with other activities. But they are more likely to stay than free wheeling adult new comers. Maybe Judo needs to have newbie weeks? Maybe we should make new students commit to a week of lessons. Commit to buying a Judo suit. Maybe Judo should start with a week camp? Perhaps the financial and time commitment, prior to starting, would work like in skiing and mean that new Judo players start off having a longer experience, with more opportunity to be taught good basics without fear of them not coming back? Could Judo be more of an experience than a regular activity? More instructors! Ski slopes are swamped with instructors. 10 students to a instructor seems about the norm. In Judo, I think we run at much lower ratios. More facilities: Ski slopes provide nursery slopes, bars, restaurants, green runs, red runs, black runs. Snow boarding areas. Trips to other slopes, ski lifts, gondolas, etc etc. In Judo we provide very little. Often not even as much as a chair for mum or dad to sit on so they can watch; let alone a coffee machine or TV to watch. Even in the class what do we provide? What does you club provide? Just a mat? What about a crash mat? What about trips to other clubs? Different types of Judo? Do you offer Kata nights? Technique nights? Ne Waza only nights? Freesyle Judo sessions? Wrestling lessons? First experiences matter, side step + snow plow = dullness. So maybe skiers could start off by just going down a slope headlong? Maybe a special learners slope that goes down, then upwards slightly (to bleed speed off) then a flat so they can stop. I also wonder about snow plow, it seems to be something done by beginners and not by experienced skiers; who use have parallel skis and turn in a different way to noobs. Should snow plow be taught? I don't know enough about skiing to say, but my gut says that it is a dead end skill that perhaps retards learning later. I have watched video of those trying to progress from newbie skiers to experienced, who are held back by a reliance on the snow plow to slow down and turn. Is it like the underhand serve in volleyball, something that if not un-learned prevents you learning the skill actually required in normal participation post the initial learning phase. Perhaps Skiing could learn about thrift, skiing costs and arm and a leg. Maybe it could be cheaper... maybe that would be a bad thing? Judo is cheap, often really really cheap. Perhaps that is a bad thing? Maybe Judo needs to increase the cost. Maybe we should all be charging club memberships, monthly fees (in advance), selling more merchandise (say for example saying that all students must have the club Judogi, not any old suit). Maybe if there was more money flowing we'd be able to pay coaches, have permanent dojo, provide better facilities and experiences? Maybe the increase in the cost of Judo would just put the last nail in the coffin? Perhaps if skiing was cheaper it would not survive, would not be successful. Snow Plow or no Snow Plow? For me this is an interesting analogy to the Breakfalls in Judo. And in Judo there is a debate about the value of teaching breakfalls. Some (most perhaps) believe that they are essential for the safe learning of Judo. Others argue that most Judoka (especially at competition level) do not breakfall, that it should not be taught in the traditional way. The snow plow seems a little used skill amongst experienced skiers and possibly a extra hurdle to jump to reach the experienced level. So perhaps it should not be taught at all? Or taught later in the process? In Judo I look at O Soto in the same light, it is infrequent in mid level Judo. The occasional elite athlete uses it. Most low level players I have observed fail to throw with it, and very often get thrown as a result of trying it. So should it be taught to new Judo players? In the UK (BJA), O Soto Gari has been replaced by O Soto Toshi and is the first throw taught to children. At a recent tournament I watched the red belts kids fight, and it was the sole throw attempted by virtually all the kids. It was ugly and ineffective and did result in success mainly via brute force. Mainly it resulted in the initiator being thrown. (I hope to quantify this via video analysis... eventually). My family love skiing, despite the slow start process. They also love Judo with our more immediate deep immersion process. Kids I think can do ne-waza randori from day one and enjoy it immensely! I think the average Judo coach is a more skilled teacher than a ski instructor. We seem to do more teaching than ski instructors. Which may or may not be a good thing. 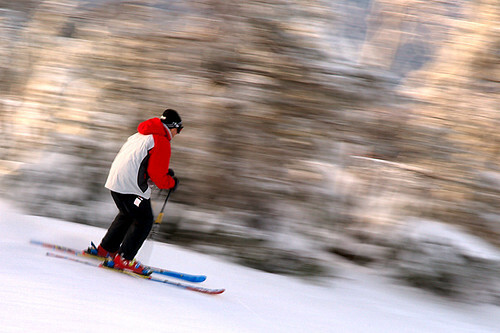 Skiing appears (again from a purely observational perspective) to be alot about developing kinetic awareness of how the forces of gravity, momentum and friction work. But I also suspect that Judo is the same. Skiing perhaps could be more immediately immersive, and perhaps judo less so? I do think that Judo could benefit from trying a while week of lessons for newcomers, committed to in advance. Perhaps once a month your club could have "New to Judo Week"? That is my thoughts on skiing and Judo for now, I hope to read up on Skiing and try and find a good ski instructor or two online and pick their brains... anyone know one? World Masters Training, Week Summary 14/46. University of Bath, Judo BSc. Block 2, Day 9. University of Bath, Judo BSc. Block 2, Day 3. Off to Bath, let the Blogging begin.